More than one in four Christians today identify themselves as Pentecostal or charismatic, and many feel that this population is the fastest-growing in Christianity today. Yet perhaps nothing stirs debate within the global body of Christ-followers faster than the topic of the Holy Spirit. With multiple formats, attractive price points and new material by best-selling authors like Max Lucado, Beth Moore and Stormie Omartian, devotional and prayer books represent a strong niche for Christian retailers. Because the primary customer that comes to my door is female, a lot of the fiction is geared toward them, which would include romance and things like that. … The fiction that I like is for guys more than it is for gals, a lot of action and people that have found themselves in some sort of predicament that God has helped them with. I think fiction is really a study in how faith has helped other people through situations and being able to apply that to the situation that you find yourself in. It’s a very practical faith as opposed to, let’s all go to church on Sunday and teach Sunday school. Former Baptist pastor Scott Gabrielson knows how valuable church supplies can be to a Christian retail store—knocking out most online competitors for the business and providing a healthy return on investment. Whether the story of Duck Dynasty’s quirky Uncle Si, the sports biography of pro football’s Robert Griffin III or memoirs of TV stars Tim Conway and Love Boat captain Gavin MacLeod, 2013 has seen a wealth of biographical titles. Big names and brands continue to be drawing cards for many consumers, with brand awareness driving Bible shoppers into stores. Publishers are also now recognizing the opportunity to provide retailers with options within each brand’s niche and adding more translations that match reader affiliations within successful brand lines. One major factor is the new relationship between Thomas Nelson and Zondervan, paving the way for cross-pollination of new translations with best-selling brands. Another overarching trend is the response to younger readers who want to understand the Bible for themselves from the ground up, rather than relying on any one teacher. Publishers are providing more and more Bible editions that offer a variety of approaches, all centered on providing a cultural and historical context for the Scriptures. The Christian products industry also continues to keep an eye on digital vs. print. For the time being at least, digital seems to be the best way for many readers to sample new or different translations without committing to an expensive print edition. And with digital formats slow to provide navigation options that feel natural for studying across multiple books, publishers still see a desire for print products and offering extras in that format. The apostle Paul told young Timothy to study to show himself approved unto God, rightly dividing the word of truth. With the flurry of study Bibles releasing or about to release, there are many options for students of God’s Word to do just that. While study Bibles have been a mainstay of every translation through the years, new formats and translations available in already successful editions are being added to the mix. Among them, Thomas Nelson recently released The King James Study Bible with updates and added features, including fresh page design, eight revised in-text maps and charts, an enhanced concordance with added Hebrew and Greek word studies and indexes of Christ and the Gospels, Paul and his letters, and Bible prophecy. Other recent and future offerings in the King James Version (KJV) include the Chronological Life Application Study Bible (October) and the Life Application Study Bible (April 2014), both from Tyndale House Publishers. When the Common English Bible (CEB) from Abingdon Press came out two years ago, the translation was admittedly in its infancy at retail, but now, the publisher is focusing on building its list. The new study Bible was created by a team of 75 scholars with that core need in mind. Another key Bible project just released in September is the Gospel Transformation Bible (ESV). It’s a project Dane Ortlund, Crossway’s senior vice president of Bible publishing, called Crossway’s “most significant Bible release in several years.” Centered on the goal of helping believers see how Christ is the point of the whole Bible, passage by passage, the accompanying notes highlight God’s redemptive purposes unfolding through history. Several other publishers also noted seeing more of a desire, particularly among younger purchasers, for notes that help them make sense of the context of Scripture passages. In response, a number of study Bibles are being created that add notes to not only help readers understand concepts or word choices, but also the larger cultural and historical context of the original text. One example is The Modern Life Study Bible in the New King James Version (NKJV) from Thomas Nelson, released last month. With more than 2,400 short articles and 66 biographies, it is designed to help users understand key principles presented in their original context and apply them around concepts like justice, community and cultural differences. Responding to younger readers and changes taking place in digital technology seems to be on the mind of virtually every Bible publisher this year. Jordan thinks that the still-clunky navigation available on many digital formats continues to lead many readers to prefer printed matter for more in-depth study. “One trend we’re really thinking about is mobility,” she said. The CEB is available already on YouVersion, a format that lets readers try out the translation risk-free and provides the publisher a chance to get feedback from and communicate with readers. Abingdon is also working on a Bible app for next spring. “When it comes to print, we’re putting our energy into the extra material that creates a unique reading experience and sets these products apart from what users have with a mobile experience,” Bohannon said. While scholarly reliability has always been and continues to be a factor for study Bible notes, at least one publisher is finding new ways to make that scholarship more relevant to readers. That’s what drove B&H to assemble a group of nine women academically trained in the original languages of the Bible to create The Study Bible for Women (Holman Christian Standard Bible). The new Bible is the third in a series of resources for women that include the Old and New Testament volumes of the Women’s Evangelical Commentary. The Bible includes free digital access to the New Testament commentary with purchase. In March, B&H is planning to release a mother’s edition of the Holman Study Bible in NKJV and KJV. Features including a four-color presentation page, LeatherTouch cover imprinted with Prov. 31:30 and extra features boost gift-giving appeal. One example is The Jeremiah Study Bible (NKJV) by David Jeremiah, who has six New York Times best-sellers and who reaches an audience of more than 10 million listeners weekly through his broadcasts. Worthy Publishing releases his new Bible Nov. 26. Features like study notes, full-page articles and sidebars with word studies and historical insights, as well as geographical and archaeological information are drawn from more than 40 years of his teaching. Another feature that makes the project stand out is links to additional online resources, including original video of Jeremiah introducing each book of the Bible. Among the other well-known names with a recent project is Stephen Arterburn, author of many best-selling books, including Every Man’s Battle, and host of “New Life Live.” His The 7 Minute Marriage Solution Devotional Bible came to stores in September. Based on the principles in the The 7 Minute Marriage Solution trade book, the Bible offers 260 devotionals designed to be read by couples in seven-minute segments. The devotional trend also seems to extend to not just well-known authors and teachers, but also to cherished brands with a reputation for reliability. Among the upcoming projects slated to release is The Daily Walk Bible, released last month from Tyndale. It draws from Walk Thru the Bible’s Daily Walk magazine and combines an interest in going deeper using key insights with a devotional thought for each day. The Daily Walk Bible is available in the New Living Translation (NLT) and New International Version (NIV) translations. Tyndale also released in October a new NKJV edition of its best-seller The One Year Chronological Bible. One of Zondervan’s fall offerings is a union of six best-selling NIV resources. The NIV Essentials Study Bible is set to release this month and draws from sources such as the NIV Study Bible, the NIV Student Bible and the NIV Quest Study Bible. The project combines elements from study notes and maps to illustrations and articles to offer different ways to view the Scriptures. Well-known names and brands also are trending outside study Bibles, and publishers are finding ways to provide content of interest to the followers of authors and ministries, as well as tap into their built-in readerships to promote the Bibles. For example, The NIV Life Journey Bible offers notes based on life principles developed by John Townsend and Henry Cloud, best-selling authors of How People Grow and Boundaries. Published last year, a new pink and brown Duo-Tone edition will be available from Zondervan in January. A November Zondervan release, The NIV Ragamuffin Bible, which was inspired by Brennan Manning’s The Ragamuffin Gospel, draws on quotes, devotions and reflections from Manning’s writings. Manning, who died in April, wrote nearly 20 books centered on grace. Charisma Media is bringing to market the most modern translation produced in the spirit of the KJV in 30 years. The word-for-word Modern English Version (MEV) translation accurately communicates while “maintaining reverence” for the Scriptures by capitalizing references for God. Other Bible lines are expanding with new translations. A sister project to the A.W. Tozer Bible, Hendrickson’s The Pursuit of God Bible is one example. Already offered in the KJV, it is being made available in the NIV as well. The MacArthur Study Bible by John MacArthur, pastor and best-selling author, will be available in the New American Standard Bible (NASB) and NIV as new relationships have made new translations possible. Along with a revised and updated NKJV edition, Thomas Nelson released these new Bibles last month. Zondervan is directing its NIV Celebrate Recovery Bible to those in recovery. Releasing in March, it draws from the eight principles of the Celebrate Recovery program. Another spring release, the Everyday Matters Bible for Women was released last year in hardcover, but a less-expensive edition is planned for this year. Among other spring offerings for specific audiences are Fulfilled: The NIV Devotional Bible for the Single Woman and the NIV God’s Word for Gardeners Bible, both releasing in March 2014 from Zondervan. Such trends also indicate that the shelf life for Bibles is shorter than it would have been even 15 years ago, but the focus now is how to speak to the needs of niche audiences in a way that they find relevant and engaging. While some of these Bibles reach higher price points, many are finding simple but durable hardcover or paper bindings the way to go. The trend toward less expensive Bibles is something Lynch notes across the board, with the Fire Bible also being re-released in paperback. This, move, along with making available to retailers mail-ready sampler booklets for several versions gives Hendrickson a way to get through some of the barriers to Bible purchasing. Publishers also are looking for new ways to help everyone from new believers to those who want to find new ways to grasp the meaning of the Scriptures. One October release, The Wayfinding Bible (Tyndale), takes three different approaches to Bible reading, with a Fly Over Route, Direct Route and Scenic Route, depending on the level of detail desired. Compass, a new release from Thomas Nelson, uses The Voice translation along with Bible-reading helps to find answers to readers’ questions and help them apply Scripture to their lives. Included are book introductions; devotional, cultural, historical, and theological in-text notes; and God’s Promises. Aside from samplers, both digital and in print, publishers take a minimalist approach to promoting new Bible brands, recognizing that the best way to promote is to simply produce tools that retailers have asked for to make features clear, and that direct customers to the best combination of translation, size, style and features to meet their particular needs. Jordan said that B&H has focused on creating packaging that uses colors to clearly indicate translation and that stays away from choices like shrink-wrapping, favoring boxes that allow customers to flip through a Bible at will. “Some retailers have their own Bible buying guide that walks frontliners or customers through simple questions, and that’s helpful, but many times those aren’t executed well if they’re done from the perspective of just one publisher’s line,” he said. Praise Break: Celebrating the Works of God! Main scriptures: “Let the redeemed of the Lord say so (Ps. 107:2a, NRSV). Starter kit contents: Worship DVD including an introduction video, music videos, movement instructionals and demonstrations, liturgical dance video and a mini-documentary; Director’s manual; Preschool/Kindergarten, Younger and Older Bible Story Leader Guides; Arts & Crafts Leader; Music & Movement Leader; Heritage & Drama Leader; Recipe Guide; Outreach/Follow-up Leader; Student Book Samples for Preschool/Kindergarten, Younger Elementary, Older Elementary and Teen; Music CD; one sample of each publicity and craft material: Craft Sticker Sheet, Promo Poster, Invitation Postcard, Leader Certificate, Student Certificate, Iron-On Transfer, Horse-and-Chariot Craft and Praise Break Chess Piece. Additional resources: Unique crafts; original songs. Previous users say: “Christ was proclaimed, people were reached, and everyone had a blast” (Paul Appleby, pastor, Central Christian Church, Columbus, Ga.). Main scriptures: There is only one true God (1 Kin. 18); Our Three-in-One God (Matt. 3); The Great I AM (Ex. 3); The one true God provided the one true way of salvation through His one true Son Jesus Christ (Gospels); Love the one true God with everything you’ve got! (Mark 12). Theme/content: Special Agents learn to know, love and live for the one true God. Day 1, they’ll learn to detect false gods of counterfeit religions. Day 2, they’ll uncover our three-in-one God, the Trinity. Day 3, they’ll find out more about the Great I AM and some of His awesome attributes. Day 4, they’ll learn about the Creator who came to redeem us from our sin. Day 5, they’ll be encouraged to stay hot on the trail of the one true God and love Him with everything they’ve got! Starter kit contents: Director Guide; Assembly Guide; Craft Guide; Snack Guide; Game Guide; Junior Teacher Guide; Primary Teacher Guide; Pre-Primary Teacher Guide; Toddler Teacher Guide; one Student Guide for each age group; Promo & Recruitment DVD; Helper Handbook; Special Agent Handbook; How Can I Become a Child of God? booklet; passport. Starter kit price: $99.99 (Starter); $189.99 (Super Starter). Additional resources: Leader Guides; Student Guides; promotional materials; T-shirts; hat; music resources (contemporary or traditional versions); puppets; station signs; student resources; spy-type gear; decorating posters; gospel booklets; King James Version resources. Previous users say: “It was very easy to follow the teacher manuals, and they had wonderful variation in methods of presentation” (Bethanne W., VBS teacher). “Thank you, Answers VBS, for not remaining silent, but for having a loud voice for truth!” (Joni W.). “The material was totally solid and flowed really well” (Katie S.). “A well-organized, professional, energetic, Bible-based God-loving program” (Steve U.). “Some people say there are many gods, but there’s only one true God!” (Calvin M., age 6). “The teaching material was fantastic! The best yet!” (Kara S.). “All the kids loved this theme and had a lot of fun!” (Aimee O.). New for 2014: Science experiments; missions opportunity with Children’s Hunger Fund to provide Food Paks and gospel tracts to hungry children around the world. Main scriptures: Judg. 6:1-16, 36-40; Ruth 1:14-17, 2:5-16, 3:10-11, 4:13-17; Neh. 4:1-23, 6:1-9; Acts 10:9-22, 34-43, 11:1-2, 12-18; Esth. 3:8-15, 4:1-17. Theme/content: Theme Verse: Luke 9:23: “If any man will come after me, let him deny himself and take up his cross daily and follow me.” Bible Lessons: Students will follow God’s trail in life by serving, following, living for, sharing and standing with their Savior, Jesus Christ. The five Bible lessons include Ridin’ Ready: Gideon was ready to serve when asked of God; Ridin’ Obedient: Ruth was obedient in following God; Ridin’ Faithful: Nehemiah was faithful when rebuilding the wall; Ridin’ Bold: Peter was bold when he reached out to the lost; and Ridin’ Courageous: Esther was courageous in the face of danger. Starter kit contents: Lesson and music DVD; songbook; music CD; music transparencies; craft book; game book; skits book; fun book; comic book; Trail Guide with stickers; theme stickers; achievement certificate; appreciation certificate; nametag; lanyard; plastic nametag holder; bulletin cover; doorknob hanger; publicity flyers; postcard; publicity poster; salvation tract; attendance chart with stickers; activity pages for Preschool, Kindergarten, Beginner, Primary and Junior; Student Books for Young Teen and Teen; Teacher Manuals and Visuals for Preschool-Teen and Adult Lessons; Director’s Plan Book with Resource CD; New Testament; bookmark; photo frame; daily crafts; Live-It! cards; bracelet; VBS pin; nylon drawstring backpack; bandana; pencil; tote bag; T-shirt; iron-on transfer; video posters; memory verse posters; Bible teaching posters; door banner; daily icon set; room decorations; transparencies. Additional resources: Triptych art; wall banners; community yard sign; vinyl banner; decoration set. Main scriptures: Weekly theme: Matt. 7:7; Daily themes: Gen. 1-3, Num. 22-23, John 3:16, Acts 1-2. Theme/content: Scavenger hunt. Join Jeff Slaughter on this VBS adventure-filled scavenger hunt that begins at Matt. 7:7 and follows a scripture-packed path through Bible studies. Starter kit contents: Essential Kit: curriculum manual (director section, preschool, younger kids Bible study [grades K-2], older kids Bible study [grades 3-5]); Ultimate Scavenger Hunt DVD (includes song videos and choreography); Official Scavenger Hunt listening CD; name badge with lanyard. Ultimate Kit: includes all of the above with Ultimate Media Kit (DVD with songs and choreography, digital curriculum CD and digital media DVD with .MOV files and more), daily theme posters, station posters, promotional posters, official T-shirt. Starter kit price: Essential Kit: $69.99; Ultimate Kit: $189.99. Additional resources: Ancillary products: split-track performance CD; theme posters; name badges; nametag stickers; lanyards. New for 2014: Curriculum now available in Spanish; oversized themed wall poster; Backyard Bible Club edition included on the curriculum disc in the Ultimate Kit or downloadable at the website. Main scriptures: “You are the God who works wonders” (Ps. 77:14a, CEB). Starter kit contents: Workshop of Wonders catalog access to free premium upgraded online registration tools available at www.cokesburyvbs.com; Director Guide; Preschool/Kindergarten Leader Guide; additional Leader Guides; sample copy of age-level Student Books for Preschool/Kindergarten, Younger Elementary and Older Elementary; complete music CD with PowerPoint slides, which includes two original preschool songs and samples of publicity and craft materials. Additional resources: Free outdoor banner with starter kit (if ordered by Dec. 31). Previous users say: “As a recreational leader, and also playing professional sports, I’m able to show these kids physical fitness, running around, exercising, warming up drills, warming up properly” (Van Tuinei, NFL professional recreation leader, First United Methodist Church, Noblesville, Ind. ); “The flexibility of this is that you could do that for any size church. I think that you could take the curriculum and choose two or three different stories to fit, whether it be a weekend or just a three- or four-day VBS” (Laura Stinnett, director of children’s ministries, Asbury United Methodist Church, Little Rock, Ark.). New for 2014: 3-D Scripture Treasures; music videos filmed on location. Main scriptures: “I have called you by name, you are Mine” (Is. 43:1); “Lead me in Your truth and teach me, for You are the God of my salvation” (Ps. 25:5); “Grace to you and peace from God our Father and the Lord Jesus Christ” (Rom. 1:7); “Jesus said, ‘Take heart; it is I. Do not be afraid’ ” (Matt. 14:27); “For by grace you have been saved through faith. And this is not your own doing; it is the gift of God” (Eph. 2:8). Theme/content: Gangway! Clear your schedule! Even the wind and the waves can’t keep kids away from this voyage. At Gangway to Galilee, kids visit exciting sites around the Sea of Galilee and discover how Jesus saves us now and eternally. Dare to make this an amazing grace adventure! Starter kit contents: Super Duper Director Guide with CD; Horizon Program Overview DVD; Gangway to Galilee Tote Bags (5-pack); Pastor Overview; Set Sails Music; Music Leader Guide; Opening/Closing Leader Pack with CD; Seashore Storytelling Leader Guide with CD; Bible Story Posters (5); Big Catch Bible Challenge Leader Guide with CD; Bible Memory Posters (5 unique); Splash-tacular Crafts Leader Pack; Sunrise Snacks Leader Pack; Sink or Swim Games Leader Guide; Fin-tastick Preschool Leader Guide with CD; Castaway Youth/Adult Bible Study Flyer; Casting Nets Mission Project Flyer; Offering Envelope; Publicity & Decorating Posters (3); Catch-O-Fish (25-pack); Publicity Postcards (24-pack); Publicity Poster; Craft Sampler Pack; Safe Harbor Sand Art Craft (12-pack); Seaside Boat Craft (12-pack); Fin-tastick Fish Craft (12-pack); iWitness Snap Bracelet (12-pack); My Savior Cross Craft (12-pack); Student Sampler Pack; Set Sail Passalong CD/DVD; High Tide Elementary Leaflets; All Aboard Preschool Leaflets; SOS Collectibles; Ship-shape Buffs, Group Identifiers; team nametags (10-pack). Additional resources: Leader resources; puppets; Student Guides; keepsakes; crafts; decorating resources; free online registration; publicity supplements; T-shirts. Previous users say: “I just want to affirm how fantastic this curriculum is! The Summit Storytelling is thorough and engaging. I especially appreciate the emphasis on finding and memorizing the Bible Code each day. Getting kids familiar with the Bible is crucial and your program definitely seeks to do that. Love the mountain theme as well! Every song and study is intentional and cohesive with the theme/story of the day. Thank you for all the hard work you put in. Our Savior and Waikoloa Lutheran Church will certainly enjoy our daily trips to the Summit!” (Janet, Our Savior Lutheran Church, Aiea, Hawaii); “Thank you for making this year’s VBS one filled with energy and fun. From the theme to the music to the stories, the program was well-written and easy to use. The PowerPoint slides made Base Camp a breeze and the supporting DVDs made the details of setting up and running Tell It VBS a joy to work with this year” (Pat); “We had a very successful VBS. We had wonderful volunteers and staff. Go Tell It on the Mountain was so fun to work with. We are still singing the songs. The best thing was we had some of the kids from last year. It was such an honor to be part of the program” (Dorothy, St. John Lutheran Church). New for 2014: Posters (14) now included in Starter Kit; how-to site videos (6) for volunteer training; Pastor’s Guide included in Starter Kit; more decorating how-to videos (14); more one-stop decorating shopping; more downloadable artwork. Main scriptures: Luke 19:28-40, 22:47-48, 23:32-56, 24:1-35; Acts 1:3-11. Theme/content: Jesus Comes as King; Jesus Conquers the Great Enemy: Sin; Jesus Breaks the Old Dominion of Death and Opens a New Kingdom of Life; Jesus Comes to us in His Word and Holy Communion; Jesus Brings His Kingdom Through His Word. Starter kit contents: Lesson plans for all age levels; lyrics and music for eight original songs in Spanish and English; invitations, flyers and attendance certificates; cut-outs; adult Bible studies; closing program; three sets of five color posters for each day’s Bible story; student worksheet samples for the three levels; one full-color promotional poster; multimedia CD with songs, accompaniment tracks, story narrations (only in Spanish) and PowerPoints. Starter kit price: $54.99 Spanish-Only Leader’s Pack; $59.99 Bilingual (English/Spanish) Leader’s Pack. Additional resources: Student worksheets; promotional posters; crafts; cardboard stand-up Jesus figure. New for 2014: Decorating option: cardboard stand-up Jesus figure. Main scriptures: Based on 1 Cor. 13. Children will learn more about how God’s love is shown through Jesus, as they move through the Gospels of Matthew, Mark, Luke and John. Session 1: Jesus Helps a Young Girl and a Sick Woman. Session 2: Jesus Forgives Zacchaeus. Session 3: Jesus Lives Forever. Theme/content: Visitors to SonTreasure Island are welcomed by the scent of exotic flowers, the taste of tropical fruits and the sound of island music. But this is no ordinary escape! There is treasure to be found here. More precious than gold, more lasting than diamonds, it is the greatest treasure of all—God’s love! At SonTreasure Island, treasure seekers will play island games, create colorful crafts and enjoy tropical snacks. But more importantly, they will discover the rich treasure of God’s love through the life of Jesus. Starter kit contents: Deluxe Kit: Bible Story Center Guides for Primary-Preteen; Prekindergarten & Kindergarten Teacher’s Guide; sample pack of Student Guides; Bible Game Center Guide; Recreation & Snack Guide; Island Crafts for Kids; Assemblies & Skits Production Guide: Reproducible Resources with decorating instructions and patterns; Elementary Teaching Resources; Prekindergarten & Kindergarten Teaching Resources; Decorating Poster Pack; Director’s Planning Guide with CD; Reproducible Music CD; Preview DVD; Director’s sample pack. Starter kit price: $169.99 Deluxe Kit; $99.99 Reproducible Power Pack. Additional resources: Reproducible Power Pack, including two CDs and one DVD with resources for churches to print and email to VBS team members and families. Leaders’ Resources CD includes resources for the Assembly Leader, Bible Story Center, Bible Games Center Leader, Recreation and Snack Center Leader and Music Center Leader. Print them out or email the files to your leaders. Print out as many student guides as you like or send student guides to families via email. Print the posters in a smaller size, or send them to a local print shop to print in a larger format. Includes Primary-Preteen Bible Story Center Guides in PDF; Prekindergarten/Kindergarten Teacher’s Guide in PDF; Assemblies & Skits Production Guide in PDF with patterns in JPG; Skit Scripts for Promotional Skit, Assembly Skits, Closing Program & Bible Story Skits in PDF and RTF formats; Bible Games Center Guide in PDF; Recreation & Snack Center Guide in PDF; Daily Student Guides in five age levels PreK-Preteen in PDF; Bible story posters in JPG; Bible verse posters in JPG; Course logo & daily logos in JPG; Music Center activities, Song Word Charts, Piano Sheet Music and Song Motions in PDF; six SonTreasure songs and two preschool songs in MP3; Decorating & Crafts Everything for decorating, creating crafts and any other arts or graphics needs; Reproducible Resources in PDF with Patterns in JPG; clip art; Island Crafts for Kids craft book in PDF with patterns in JPG; Decorating Poster Pack in JPG; Assembly Resources Everything on Assemblies DVD, but formatted to be used with presentation software such as ProPresenter or Mediashout; humorous videos that introduce each session’s Bible story in MOV; music videos for each of the songs in MOV; Practice videos for the song motions in MOV; Bible story posters in JPG; Bible verse posters in JPG; course logo and daily logos in JPG. Previous users say: “I love everything about Gospel Light; from every aspect, the music, crafts, games, stories, all come together to get God’s message across for the children. The teachers and helpers love it also because the curriculum is so easy to use. It’s just an awesome and fun experience for all ages!” (Alice Mohn, Westminster Presbyterian Church, Pennsylvania); Gospel Light’s VBS “never fails to deliver a strong biblical message, with all the bells and whistles that any church could ever use” (Erin Beal, Trinity Lutheran Church, Ohio);“Out of the approximately 50 children, there were 30 who either asked Jesus into their hearts for the first time or recommitted their prior experience” (Mary Macho, Canyon Hill Nazarene Church, Idaho). New for 2014: Reproducible Power Pack. Main scriptures: Based on 1 Cor. 13, just as is full SonTreasure Island program (see above). Theme/content: Same as SonTreasure Island VBS (see above). Starter kit contents: Director’s Guide; Bible stories with creative storytelling techniques that tell how Jesus showed God’s amazing love when He was here on Earth; variety of activities that appeal to children’s many learning styles, including games, crafts, music and more; a Teacher & Parent Connection for each lesson that can be given to parents; reproducible CD that includes music and lesson materials ready to print or email (student guides, lessons ready to email, modifiable flyers, etc. ); closing program for the worship time in your Sunday morning worship service. Previous users say: “Gospel Light’s curriculum is so easy to follow. Plus, it is so biblically sound. I love it!” (Cyndi Young, Elam Baptist Church, Ga.); “It is director-friendly and teacher-friendly” (Sherry Watts, St. Thomas More Catholic Church, Kan.). Main scriptures: Day 1: Men bring their friend to Jesus for healing (Luke 5:17-6); Day 2: Jesus dies and comes back to life (Matt. 27:11-28:20). Theme/content: Countdown to the most fun weekend in the universe! As kids explore God’s infinite love, they’ll practice down-to-Earth ways to love each other. Starter kit contents: Director Resources: Director Go-To Manual; Blast Off Program Resources DVD; VBS P.R.O. Volunteer Resources; Music and More Leader Manual; Out-of-This-World Bible Adventures Leader Manual; Projects-With-a-Purpose Leader Manual; Have-a-Blast Games Leader Manual; Mission Sendoff Leader Manual; Blast Off Music Leader Version CD; Student Materials Sample Pack. Additional resources: Updates and resources at www.group.com/VbsTools. Previous users say: “The best part about Weekend VBS was the organization and pre-planning that was already done for me. It was so simple to use and we were able to customize it to our situation. I love that it was a three-day schedule.” (Heather Murphy, VBS director). Main scriptures: Day 1: The Israelites cross the Red Sea (Ex. 14:1-15:21); Day 2: God provides manna and quail (Ex. 16); Day 3: Israel defeats the Amalekites (Ex. 17:8-16); Day 4: Moses remembers Passover (Ex. 12:1-30); Day 5: God gives the Ten Commandments (Ex. 20). Theme/content: Caravan with Moses and the Israelites. Starter kit contents: Director Resources: Ultimate Director Go-To Guide; Ultimate Director Go-To Recruiting & Training DVD; Decorating Places: Wilderness Escape DVD; Wilderness Escape Clip Art & Resources CD; VBS P.R.O. Volunteer Resources; Publicity Poster; Publicity Samples; Bringing It Home: Family Faith-Builders Devotional; Volunteer Resources: Celebration Leader Manual; Israelite Camp Tent Host Manual; Moses’ Tent Leader Manual; Fun & Games Leader Manual; Celebration Music DVD; Celebration Leader Version CD; Israelite Tent Sample Pack; Student Resources Sample Pack. Additional resources: Updates and resources available at www.group.com/VbsTools. Previous users say: “We loved the Athens curriculum! We could teach whole families and they could enjoy the experience together. Everyone enjoyed the ‘living history’ format. Before the experience, we thought this was going to be for visiting children and their families. We were surprised by how it ended up being a faith-developing experience for adults and unsaved family/friends who were connected to our members. It was just plain fun!” (Amy Ellzey, VBS director). New for 2014: Only three trained Station Leaders (Celebration, Moses, Fun and Games); only three main stations to decorate; preschool-friendly options; smaller tribe sizes. Main scriptures: Day 1: Jesus heals 10 lepers (Luke 17:11-19); Day 2: Jesus reaches out to a Samaritan woman (John 4:1-30); Day 3: Jesus washes the disciples’ feet (John 13:1-17); Day 4: Jesus dies and comes back to life (Luke 22:47–24:12); Day 5: Ananias bravely helps Saul (Acts 9:1-19). Theme/content: God filled the world with a lot of crazy creatures—including you! When kids feel weird, different or even lost in a crowd, nothing compares to the unconditional love of Jesus. Starter kit contents: Director Resources: Weird Animals Ultimate Director Go-To Guide; Decorating Places: Weird Animals DVD; Weird Animals Clip Art & Resources CD; Weird Animals Ultimate Director Go-To Recruiting & Training DVD; VBS P.R.O. Volunteer Resources: Sing & Play Rock and The Tail End Leader Manual; KidVid Cinema Leader Manual; Imagination Station Leader Manual; One-of-a-Kind Bible Adventures Leader Manual; Critter Café Leader Manual; Untamed Games Leader Manual; Spotlight VBS Leader Manual; Ozzy’s Preschool Park Preschool Director Manual; Ozzy’s Preschool Park Bible Adventures and Missions Leader Manual; Ozzy’s Preschool Park Games Leader Manual; Ozzy’s Preschool Park Preschool KidVid Cinema Leader Manual; Ozzy’s Preschool Park Craft & Play Leader Manual; Weird Animals Sing & Play Music Leader Version two-CD Set; Weird Animals Sing & Play Music DVD; KidVid Stories DVD; Student Resources: Bible Memory Buddies set (5); Bible band (elementary); Ozzy’s Bible book (preschool); Watch for God wristband; name badge; iron-on transfer; Follow-Up Foto Frame; Imagination Station samples. Previous users say: “Group gives you the recipe and the resources you need to do VBS. Its so simple yet so profound at the same time. 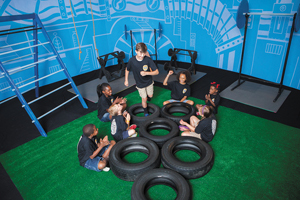 Easy to put together, full of energy, the kids stay connected, and every step is so completely intentionally done” (Lisa Jost, VBS director). New for 2014: KidVid Cinema; Weird Animals Bible Memory Buddy app. Agency D3: Discover. Decide. Defend. Theme/content: Trace it back to just the facts! The evidence is clear. The proof is all right here! Come discover, decide and defend the truth about who Jesus really is at Agency D3. Starter kit contents: Administrative Guide for directors; Decorating Made Easy; Music for Kids CD; Takin’ It Home CD; One Kid’s Evidence Kit: Grades 1–6; special agent carabiner; special agent rearview sunglasses; catalog; Jump Start poster; promotional DVD; Director’s badge (only in Jump Start Kit). Starter kit price: $34.95 Jump Start Kit; $99.99 Kids and Preschool Starter Kits. Additional resources: Kids Starter Kit $99.99; Preschool Starter Kit $99.99. New for 2014: Jump Start Kit; Kids Starter Kit; Preschool Starter Kit; Takin’ It Home CD. Main scriptures: “ ‘For I know the plans I have for you,’ declares the Lord, ‘plans to prosper you and not to harm you, plans to give you hope and a future. Then you will call on me and come and pray to me, and I will listen to you’ ” (Jer. 29:11-12, NIV). Theme/content: MEGA Sports Camp is a sports outreach that teams Bible truths with sports skills. Kids pick from basketball, soccer, cheerleading, baseball or football. Daily themes are Strategize, Prepare, Launch, Win and Persist. Daily Bible stories are derived from the life of Moses. Starter kit contents: Director Guide; poster pack; Director DVD & CD; Art CD; Rally Guide (large group/worship time); music and media DVD and CD; Coach Huddle Guide (small group time); sports playbooks for cheerleading, basketball and soccer (flag football and baseball optional); Sports Flash (kids’ take-home); Theme Keepers for kids; Welcome to Holsom: Adventures in Faith (salvation/discipleship piece); T-shirt; sports bottle; magnetic photo frame. Additional resources: T-shirts; iron-ons; carabiners; water bottle. Main scriptures: Theme verse: “Thy word is a lamp unto my feet, and a light unto my path” (Ps. 119:105). Theme/content: Arrow Island is full of tropical habitats just waiting to be explored! Each day, students will start off at their base camp for a time of worship and singing. Throughout the day, they’ll play games at Rolling River Rapids, make crafts in Misty View Gardens and enjoy tropical snacks at Signal Rock. They’ll even get to meet Jimmy, his friends and Feathers—the last of the Booki Booki birds. Most importantly, Shady Cove Trail will lead students to five locations around the island, where they’ll learn about people in the Bible who faced a decision—whether or not to choose God’s way. Arrow Island: Choosing God’s Way shows students the importance of choosing obedience, godly friends, kindness, courage and active faith. This VBS will provide biblical examples that equip students to choose God’s way in every detail of their lives. Memory verses are: John 14:15 (Focus: God wants people to obey Him out of love. ); John 15:12; (Focus: God wants us to choose good friends who will help us live for Him. ); Eph. 4:32 (Focus: God wants us to be kind and forgiving even when people are not kind to us. ); Deut. 31:6 (Focus: God wants us to be true to Him regardless of what other people do. ); Col. 3:23 (Focus: God wants us to serve Him with our whole heart.). Starter kit contents: Director’s Guide; Director’s Resource CD Set; Thank-you Card; Teacher Books (2s & 3s—Youth); Student Activity Sheets (2s & 3s—Junior); Youth Handbook; Adult Bible Study (5 Decisions That Changed the World); salvation poster; gospel bookmark; salvation tracts (5); Welcome to the Family, Family Fun sheet; Operation Bangladesh Mission Offering poster; jumbo theme poster; theme poster; invitation flyer; doorknob hanger; postcard; bulletin cover; craft ideas book; monkey photo frame; alligator key chain; music CD; attendance chart; nametag; registration card; Arrow Island pass; backpack; pouch; sticker sheet; theme balloon; theme button; logo sticker; iron-on transfer; sticky notepad; island gummy treats; lizard pencil; frog squirt; inflatable monkey; monkey take-home bags; catalog; promotional DVD. Starter kit price: $89.99; net 120 days and up to 35% off with purchase of a package deal by Dec. 31. For details, see the VBS Retailer’s Guide at www.rbpVBS.org/retailers. Additional resources: Evangelism; decorations; promotions; crafts; gifts, awards and more; games; snacks; attendance; puppet resources; teaching resources. Operation Bangladesh: Reaching Children for Christ is the 2014 VBS Mission Offering Project option. Previous users say: “CEF is pleased to once again endorse Regular Baptist Press’ VBS curriculum for 2014. We continue to be encouraged by the strong biblical content and gospel presentations of Regular Baptist Press material and encourage you or any of your partnering churches to use their material for your VBSs” (Rev. Moises Esteves, vice president, USA Ministries, Child Evangelism Fellowship). New for 2014: New games and snacks product categories. Main scriptures: Day 1: Gen. 1; Day 2: 1 Kin. 17; Day 3: Dan. 6; Day 4: John 3, 19, 20; Day 5: John 14, Rev. 1, 4, 21, 22. Theme/content: Jungle Safari: Where Kids Explore the Nature of God. God is Creator. God is Provider. God is Protector. God is Savior. God is King. Starter kit contents: Director’s Guide binder; Planning and Music six-disc set, including Planning & Missions DVD with program overview and missions segments, music video DVD with new music from Yancy, music CD, Opening & Closing CD, Exportable Media DVD (MP3s and MP4s) with all files needed to download for presentation software and Decorating & Publicity CD; Age-Level Resources three-disc set, including Preschool CD (PDF of preschool section of Director’s Guide, additional files referenced in the guide, plus audio and print files for teaching preschoolers), Elementary and Preteen CD (PDF of Director’s Guide, additional files referenced in the Director’s Guide, plus digital files for all leaders’ guides and cards), Teen CD (audio, video and print files referenced in Leader’s Guide—Teen); Leaders’ Guides for Sites; one of each age-level Student Book; Decorating Pack and Guide; Bible Story poster pack; Daily Theme poster pack; Site Names poster pack; Missions poster pack; samples. Additional resources: Age-level student books; Jungle Bible Pals by Floppets; promotional helps; decorating items; stickers and other themed items. New for 2014: Friendly adaptations for special needs; Service & Missions Site; Crafts & Music Site; missions curriculum from Beth Guckenberger (Back2Back Ministries); music by Yancy. The Jesus Connection…What a Friend! Main scriptures: “God … invited you into this wonderful friendship with his Son, Jesus Christ our Lord” (1 Cor. 1:9, LB). Theme/content: The Jesus Connection encourages character-building qualities such as purity, trust, Christian service and loyalty, and teaches students how to live in fellowship with Jesus. Lessons integrate being connected to Jesus through print, digital and social media. Starter kit contents: Cross body bag; student and teacher books for preschool, primary, junior and teens; sample adult lesson; planning DVD; theme song; movie; water bottle; neon shoe laces; glow sticks; puzzle; word search game; sunglasses; theme poster; wristband; catalog; order form and more. Additional resources: Adult curriculum; crafts; music CD; outdoor banner; publicity items; VBS T-shirts; baseball cap; Bible storybook; Bible verse posters; application posters; nametags; certificates; ABCs of Salvation; class record books; attendance charts. New for 2014: New music and videos, activities and apparel; online resources. Vacation Bible School (VBS) rolls around every year at this time, setting up one of the busiest selling seasons of the year for Christian retail stores. Whether VBS fills you, the retailer, with dread or anticipation, it’s important to remember the benefit your store can offer area churches in meeting their ultimate goal—building Christ’s kingdom. Research shows that 67% of churches in the United States hold Vacation Bible School each summer. An average church spends $350-$500 on curriculum materials for their Vacation Bible School program—and that can add up to revenue for your store as you demonstrate your commitment to serve the local church. However, many stores report that they feel like the local church has largely abandoned them. For many churches, stores are no longer the most convenient and knowledgeable resource for curricula. Churches that once were regular customers are rarely seen now. Because of the new abundance of distribution possibilities, competition has increased. But these changes aren’t a sad reality—they represent an opportunity—and it’s time retailers seize the moment! Reframe your notions of how to ensure you are the first choice of local churches. ?What do other sources have that my store doesn’t? ?Why should a local church buy from me instead of another source? ?Do the local churches in our area know that our store is a source for VBS materials? ?Do the children’s directors in every local church know who we are? ?What can I do to make myself an indispensable resource for the churches in my area? In my region? As you fire up your creative thinking, consider how you can make your store the most convenient source for church ministry needs. Do you offer them something no one else can? Maybe you can drop off their order personally. You not only offer them that convenience, but you get to meet them again face-to-face. Don’t forget to reach out.You may know the senior pastor, but do you know the children’s director. What about the VBS director? Which new churches have popped up in your area? Find them! It will take some effort, but set out to discover which churches did a VBS program the previous year. Which program did your church use last year? This gives you a starting point to determine what programs they will be drawn to, then find out why they chose the course they did. Your goal is to understand what they value and what features of the ministry matter most to them. If a church had a good experience with one program, they will be inclined to look at the same publisher again—so knowing that helps you determine their future buying habits. When did you hold your VBS program? These dates and times are important information. By keeping track of this, you’ll quickly get an idea of the timing of the VBS market in your area. Great follow-up questions to this will help you determine when people will be in the market for materials and will help you to advise others on trends in your area. There is no longer a standard way churches do VBS. Some may have a week-long morning program, some an evening program. Some begin VBS at the end of the week and use weekend services as part of their VBS. Others may do a weekend program or five VBS Sundays in a row. There are now so many options for churches that it’s important to find out what works for each one. It’s critical to your success in resourcing them. Did you have a good experience? This will be the single largest indicator of whether the church will do VBS again and whether they might use the same publisher. What were the standout moments? Was it a powerful assembly? Increased attendance? Children accepting Jesus as their Savior? Their own reports of amazing moments will show you the values and the heart of the church. What was the biggest challenge with VBS last year? This important question will establish for you ways that you can help them with their VBS purchases this coming year—establishing yourself as that indispensable, helpful, wise friend they need. If I could assist you with one thing for next summer, what would it be? This is great information for you as you plan in-store promotional activities. If you see a trend between churches, address it proactively. Be sure to get contact information—address for the VBS director, best phone contact, whether email or text works better and email addresses. Use all the information you collected to better serve the churches in your area. Look for trends, similarities, differences and the breadth of the market. It will help you determine the manpower and intensity you want to put towards developing your VBS business in creative, fresh ways that appeal to a new generation of churches and buyers. 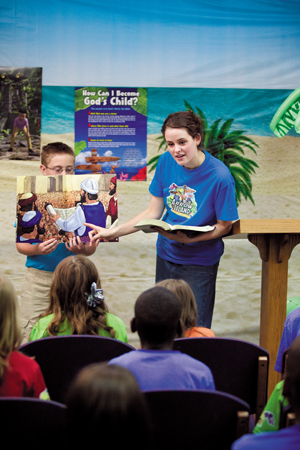 Each publisher offers you resources to promote the new VBS curriculum. Use them creatively. We know that direct mail is expensive, but it is still one of the most effective ways of communicating and getting attention from customers. While email is more cost-effective, inboxes are easily ignored. Many people never reply to email anymore—so try short, catchy text messages. Make your communication personal. You spent all that time getting to know the churches, so now make your message personal. In today’s world of too much marketing, you can make yourself stand out because you know the customer personally. If you run an independent store, it is one of the things that sets your store apart from other bigger retailers. If you have an active website, use the resources provided by your publisher to fill out the information on your site. Gospel Light offers a publisher-designed site that gives your customers the same information as they’d find on the main publisher’s page, but then takes the customer back to your site to complete the purchase—and that is offered to you free! Whatever resources each publisher offers, take advantage. Use them all! In-store signage, bag stuffers and flyers in invoices are all ways to use the many resources that are available to you. Use special sales and promotions wisely—so that you tie up sales before the customer has time to look elsewhere. They’ll appreciate the feeling of that decision being “done,” so speak to them earlier than you have ever done before. Don’t wait until you get your kits; start talking to customers now. Time marches on—and we need to think creatively about the old model of VBS workshops. People are busy—their calendars are packed. Taking time for a traditional workshop experience may not be possible, so offer a creative approach. Using the information you received in your phone conversations, determine how to make the workshops something they won’t want to miss. Offer training. The more professional, the better—this gives people a reason to give up a few hours of their time—and allows you to feel comfortable asking professionals to come to your event. In addition to short product presentations, provide training for participants on how to have an effective VBS program. Gospel Light—and perhaps other suppliers as well—offers industry leaders who can provide training for your customers and their teams at your VBS workshops. Or, use other resources, including Skype presentations or video conferencing. Make the event the best experience possible. You might also ask a seasoned local leader to come and discuss VBS best practices. Provide discounts, but only at the event. As I traveled the country last year doing VBS workshops, I noticed that many stores never offer a reason for the churches to attend! A special promotion that benefits them also secures their order that day. I challenge you to secure the kit orders early—don’t let them walk out undecided. This simply lets them move on to another provider for their resources. Make the offer compelling, timely and available only at the workshop. I know that having a dedicated VBS salesperson at your store is unlikely. I also know that when I make this suggestion, it may just come down you! But make sure you or your designated expert knows as much as possible to answer questions and help a customer make the right choice for their ministry. With a little effort, you can become familiar with the various programs so that you truly can help a customer weed through all the choices on the market in order to make the best decision. Use the resources you have access to, like the publishers website—they have distilled their materials down to the basics. But aim to know more than the basics. Look at the director’s planning guide in each kit. You’ll get a feel for the new features and key distinctives for each theme. Speak to the publishers yourself. Ask them to help you narrow down the profile for the perfect church for their particular program. If the person you’re talking with cannot do this, then ask for someone else—the marketing director or publishing director. Be bold. Publishers want your business—it’s in their best interest that you succeed! With some creative thinking about the “ways we’ve always done it” and some thought and prayer, you could see your VBS sales soar as you become the indispensable expert and friend of the local churches in your area. Donna Lucas has served as director of children’s publishing and marketing at Gospel Light for seven years. Thousands of fans will flood large arenas on the West Coast this January. When the lights go down and the smoke makes its way to the rafters, raucous applause and cheers will fill up domes where professional athletes scored victories only the night before. But it won’t be U2 or Coldplay taking the stage. The applause will be for Christian artists and the cheers will be directed to the One it’s all for as the Winter Jam Tour Spectacular heads out on its annual three-month trek. For the past three years, the popular multi-artist tour has topped Pollstar’s Top 100 Tours chart, meaning it’s the largest first-quarter tour of any genre in the world. This year alone, Winter Jam saw a record-setting 42 sellouts, hitting 44 of the country’s largest arenas and playing to a combined total audience of nearly 554,000 people. Pepsi will serve as the tour’s leading sponsor in 2014. In the past 13 months, two Christian releases have topped the Billboard all-genre charts: TobyMac’s Eye On It (ForeFront) and Chris Tomlin’s Burning Lights (sixstepsrecords). When Eye On It became the best-selling album in the country the week of Sept. 5, 2012, it was the first time a Christian album had hit No. 1 on the all-genre chart in 15 years and only the third time in history. In the last year alone, Matthew West appeared on Katie; For King & Country made its late-night debut on The Tonight Show with Jay Leno: Skillet rocked on Conan; Mandisa performed three times on Good Morning America; and Jamie Grace, TobyMac and Amy Grant were all featured on The View. The lines are blurring, and Christian music is no longer confined to the walls of the church. Rather, it is going head-to-head with mainstream music, shattering walls, defying naysayers and testing limits. A variety of factors come into play, but perhaps the most obvious is the fact that today’s Christian music is equally as good sonically as anything in secular music. For a genre that’s always been defined by lyrical content versus sound, it’s also important to note that Christian artists are now singing about all aspects of life, making their songs more universal, all while writing from a Christian perspective. A song that tells a good story has the ability to make a connection regardless of the belief system of the listener. At the end of the day, a good story is a good story. Good art is good art. Christian artists are telling stories people want to hear and creating art that’s resonating with a broadening audience—and mainstream culture is taking notice. It’s important for Christian retailers to pay attention to when and where Christian music is popping up in the mainstream. If something is labeled “Christian,” even non-believers are looking to the Christian subculture to provide product, both online and in store. High-profile public relations has become the new gateway to mainstream audiences. Retailers need to pay attention to where the music they sell in their stores is appearing, whether in a highly circulated magazine or newspaper, on a morning news program, in a popular television show or in the credits of an upcoming film. While there’s not always a direct correlation between publicity and sales, it definitely presents an opportunity for increased sell-through, and retailers should be ready. As publicists look for opportunities to “pitch” their Christian clients to the media, it’s important to align artists with outlets that are natural fits. Sometimes, it’s the artist’s story that grabs the attention of media gatekeepers, but other times, it’s an artist’s sales history. Bozeman Media represents a roster of Christian artists ranging from Aaron Shust and Jason Gray to Building 429 and Montell Jordan. Owner and veteran publicist Janet Bozeman said her pitching approach looks different for every artist and every media outlet. While it’s a mix of numbers and connecting points, an overarching narrative is always going to be a significant factor. That’s why it’s important for retailers to know the stories behind the albums they’re selling and the artists they’re representing. For Matthew West, who was recently interviewed by Katie Couric, West’s song “Forgiveness” has resonated with listeners because it’s based on a true story about a woman whose daughter was killed by a drunk driver. Years later, while the driver was in prison for taking a life in the accident, the mother visited him, told him she forgave him and actually appealed his sentence, cutting it in half. The powerful real-life story behind the song struck a chord and became an attractive selling point for the bookers at Katie. For other artists, like Switchfoot and Needtobreathe, the fact that they are making waves in two markets is a compelling story in and of itself. Skillet also has seen success in dual markets. When handling a crossover act, Zach Kelm, owner of Q Management, which represents rock acts Skillet, Decyfer Down and We As Human, contends the best way to reach consumers is to meet them where they are instead of asking them to come to you. “You want to market where those audiences live (where they spend their time, buy their music, get news and info, communicate with their peers, etc. ), and, therefore, you have to point your marketing where it will be effective,” he said. Bozeman admits it’s a delicate balance attempting to juggle aspects of faith with the aims of mainstream media outlets. She asserts that an artist’s faith is what cements them in the Christian genre in the first place, but that there are many ways of telling the same story depending on the audience. Zach Kelm adds that mainstream gatekeepers are always surprised by the loyalty and passion of Christian music fans, an important differentiating factor. While Christian artists are becoming more accepted by mainstream culture due to compelling stories and loyal fan bases, social media has also changed the landscape for artists. In addition to high-profile PR, intentional social media efforts and traditional methods like touring, advertising and radio impressions, artists have more opportunities for film and television placement than ever before. Songs from The Afters, Britt Nicole, TobyMac and Francesca Battistelli have all recently been used in commercials, TV promos and shows, and movies. John J. Thompson, director of creative and copyright development at Capitol Christian Music Group, said Christian music has become a positive option for music supervisors. Thompson also observed that the abundant number of options for awareness and placement today can be a detriment. Consumers are overwhelmed by information, making it hard to grab their attention. However, in the end, marketing and publicity efforts converge to create an overall brand—which translates into sales. One media appearance is a win, but every foray into the mainstream is a building block. Case in point: Needtobreathe. In 2011, Taylor Swift, arguably the most popular artist in today’s contemporary music scene, personally asked Needtobreathe to open for her on her record-setting Speak Now tour—simply because she was a fan. That high-profile slot catapulted the under-the-radar band into the spotlight and onto late-night television. The rock band, which has been named the Gospel Music Association’s Group of the Year multiple times and garnered a string of hits at Christian radio, made the late-night rounds, performing on Leno, Letterman, Fallon and Conan. As long as the content is faith-based, there will always be a barrier of some sort between mainstream and Christian music. The topics and perspectives of Christian music can be, at times, controversial to a non-believing audience, and generally speaking, secular gatekeepers have an obligation to ruffle as few feathers as possible when booking talent. It’s not a perfect science, but the tide is turning in favor of faith-based artists. While songs with universal topics or veiled references to faith might have a better chance at mainstream success, it’s not just the “crossover” acts garnering attention. Chris Tomlin was lauded by TIME magazine as “most likely the most often sung artist anywhere.” Jamie Grace appeared on The View because hosts Sherri Shepherd and Elizabeth Hasselbeck were fans of her song “Hold Me.” President Obama took it upon himself to ask Natalie Grant to sing at the White House because of her advocacy work for human trafficking. The reasons for opportunities vary, but the reality is the same. The playing field is leveling. Culture is taking notice of Christian music, and the best thing Christian retailers can do is seize every moment. Although increasing sales is the end goal, it’s also important to realize retailers have the chance to be a cheerleader for this genre of music. The opportunity for Christian retailers remains—to be a beacon of light in their community. Pay attention. Make sure your store’s music buyer is receiving press releases from music labels. Be aware of when and where Christian artists are featured in mainstream media. Do your homework. Read articles online. Watch television appearances. Seek out the magazines and newspapers where Christian artists are interviewed. Learn as much as you can. Champion Christian music. With every media appearance, you have a chance to support Christian music in your community. Is a Christian artist featured in your local paper? Cut out the article, and hang it on a bulletin board near the music section so your customers can see it. Has an artist been featured on a high-profile news show? Feature the interview and/or performance on a loop beside a display of their CDs. Get creative. Become an expert. More than just selling music and knowing the release dates of popular albums, have a few key people on your staff who are passionate about music and who can do more than just sell an album. Choose some key support staff who can provide background on the various artists represented in your store. Be the place consumers come to learn about Christian music, not just purchase it. Be prepared when opportunity knocks. To maximize opportunities surrounding high-profile publicity, be sure you have ordered the right amount of stock and consider placing the featured artist in a high-traffic location. Make customers aware of the reason you’re featuring the artist. Create a sign that says, “As Featured on The Tonight Show on Wednesday Night” Have a stack of magazine and newspaper clippings on a table near the display that lauds the featured band. Act as an “entry point” for non-Christians. If a non-Christian is intrigued by the music, there’s a possibility that if they find out it’s a Christian artist, they will come to your store looking for the product. This is a great way to invite new traffic into your store, and to introduce people to Christ. While it’s true that many non-believers would likely first go to a mass retail chain, quantity may not be as readily available in that chain’s Christian/gospel section. That’s where you come in. Never underestimate the ways customers find your store, and be ready to offer them quality, friendly assistance when they come. You never know when you might be someone’s first example of Christ. Eric Metaxas’ 2010 biography, Bonhoeffer, packed an unexpected sales punch for publisher Thomas Nelson. reaching New York Times best-seller status. Now, an October scholarly release on the legendary Dietrich Bonhoeffer likely will create retail interest beyond academic circles. The reason: Bonhoeffer the Assassin? (Baker Academic/Baker Publishing Group) challenges the widely held view that the German theologian participated in a plot to assassinate Adolph Hitler. The book’s three authors— Mark Thiessen Nation, Anthony G. Siegrist and Daniel P. Umbel—don’t subscribe to the conspiracy view, but rather argue that Bonhoeffer maintained his commitment to peacemaking until he was put to death by hanging about three weeks before the end of World War II. The Baker title will be followed next month by The Bonhoeffer Reader, a collection of Bonhoeffer’s theological writings. The title is from Fortress Press, part of Lutheran publisher Augsburg Fortress. Not only does this interest demonstrate how scholarly inquiry can branch into wider circles, but Jeff Crosby, executive director of sales and marketing for InterVarsity Press (IVP), said reference materials possess considerable backlist potential. Crosby said it is not uncommon for second-year net unit figures for IVP Academic titles to be as high or higher than IVP’s trade books. “That results from it taking a bit longer to be recognized among the members of the academy, to garner peer reviews in key journals and to be adopted by professors,” Crosby said. Chris Reese, a freelance writer and editor with Moody Publishers, sees a budding community of Christians outside academia who also are interested in apologetics. One of Moody’s forthcoming titles that illustrates that is The Soul: How We Know It’s Real and Why it Matters by J.P. Moreland, releasing in March 2014. Some trade titles that may cross over into academic are How to Talk to a Skeptic by Donald Johnson (Bethany House/Baker Publishing Group, October); Big Bang Big God by British scientist Rodney Holder (Lion Books, Nov. 1); and iGods by Craig Detweiler (Brazos Press/Baker Publishing Group, November). In an effort to help believers “rightly divide” the Scriptures, biblical explorations and expositions represent a mainstay of this genre, with numerous titles hitting the market this fall. Among these releases are The Psalms by Andrew Schmutzer and David Howard Jr. (Moody, October); The Old Testament is Dying by Brent Strawn (Baker Academic, October); and Feasting on the Gospels—Matthew edited by Cynthia Jarvis and Elizabeth Johnson (WJK Press, Volume 1, November; Volume 2, December). Other November releases are Biographical Bible by Ruth Tucker (Baker Books/Baker Publishing Group) and Visions of the Apocalypse by Bruce Chilton (Baylor University Press). This month Zondervan will release the first two of its 43-volume “The Story of God Bible Commentary” series, which launches with two installments, The Sermon on the Mount by Scot McKnight and Philippians by Lynn Cohick. McKnight and Tremper Longman are general editors of the series, which will span a decade. Barbour Publishing will release a pair of Bible resources during the first quarter of 2014: Navigating the Bible by Christopher Hudson (February) and The Complete Bible Companion (March), an updated volume of study helps, one-year reading plans and other tools. Other forthcoming titles are 100 Tough Questions About God and the Bible by Stephen Miller (Bethany House, April) and The Moody Bible Commentary written by the faculty of Moody Bible Institute and edited by Michael Rydelnik and Michael Vanlaningham (February)—a commentary five years in the making. IVP Academic has two November releases that review the nature of evangelical biblical interpretation, The Lost World of Scripture by John Walton and The Future of Bible Interpretation by Stanley Porter and Matthew Malcolm. B&H Academic, an imprint of B&H Publishing Group, has a pair of November resources planned as well. Illustrated Bible Survey by Ed Hinson and Elmer Towns includes introductions to 66 books, photos, maps, charts and other study aids. An Introduction to Biblical Ethics by David Jones explains the nature, relevancy and structure of moral law as revealed in Scripture. Those volumes follow October’s release of a revised edition of Theology of the Reformers by seminary dean Timothy George and The Anabaptists and Contemporary Baptists by theology professor Malcolm Yarnell. The kickoff of the school year and church programming makes fall a major season for academic books, observed Baker’s Dyer, adding that seminarians and pastors launching sermon series need thoughtful resources. “Getting these books out in front of these customers is helpful not just for sales, but for making sure they have access to the finest resources created by the brightest minds in the Christian academic world,” he said. That includes such books as Baker Academic’s recently released third edition of Christian Theology by Millard Erickson, which Dyer said has had a huge influence on seminaries and churches. Reese said two enduring titles that represent accessible introductions to theology for laypersons are The Moody Handbook of Theology and Charles Ryrie’s Basic Theology. He also recommends retailers remember the “tribe” of evangelicals who gravitate toward academic books and such popular authors as John Piper, D.A. Carson and N.T. Wright. Reese favors promotions aimed at students and academicians getting into the new school year. “It’s rare to see a display devoted to academic books, but that would be beneficial,” he said. These books are “built to last,” with higher price points and longer life cycles, said WJK’s Stephens. Men’s books represent but a sliver of overall sales in the Christian market, but the wealth of forthcoming titles demonstrates publishers’ belief in the genre’s viability. “Men have demonstrated they will indeed buy a book if it addresses a felt need in their lives,” said Joey Paul, executive editor of the FaithWords imprint of Hachette Book Group. Nick Harrison, senior editor at Harvest House Publishers, recalls meeting such a need. An insurance man visited Harrison recently to tell of buying 100 copies of the gift edition of One Minute Prayers for Men. As a result, he formed authentic relationships with many prospective clients, not to mention his coffeehouse barista. Men are always interested in practical books that make an impact, said Tracy Danz, vice president and publisher of Zondervan Trade Books. He lists Zondervan’s October release, Fight by Craig Groeschel, and January’s Bad Dads of the Bible by Roland Warren as examples. One of the newer Christian publishers targets men with five of its 40 annual titles. The newest release this month from Lighthouse Publishing of the Carolinas is Up by Bob Ravener, executive vice president for Dollar General Corp.
Acquisition Editor Eddie Jones said that Up will appeal to men by illuminating such values as hard work, resilience and creativity in a culture that glorifies posturing and good looks. Ironically, Jones sees unemployment as a primary reason why men are reading more. In the past, men may have been busy reading reports, spreadsheets and manuals for work, but in unemployment, many have more time to read books. With nonfiction, Jones thinks men are seeking help in finding employment, God’s call on their lives and significance in a culture that discounts their worth. “As more men find themselves outsourced, out of work and shoved to the end of the bench, books of this nature will continue to find male readers,” the Lighthouse editor said. While lagging far behind women’s nonfiction in sales, men’s books have produced a number of classics, such as John Eldredge’s Wild at Heart, Stu Weber’s Tender Warrior and Point Man by Steve Farrar. More recently, B&H Books’ The Resolution for Men by Stephen and Alex Kendrick—spawned by their hit film Courageous—boosted category sales last year by 47%. Harvest House also sees considerable potential in men’s books. In addition to August’s With Dad on a Deer Stand by Steve Chapman and this month’s In It to Win It by Steve Lawson, the publisher releases An Old Guy’s Guide to Living Young by Bob Barnes in October. Thomas Nelson has three upcoming men’s books, starting with an updated version of The Book of Man by former U.S. Education Secretary William Bennett (October). It follows in November with Mansfield’s Book of Manly Men by best-selling author Stephen Mansfield and retired Lt. Gen. William Boykin. They examine manly virtues through the lives of such leaders as George Washington. On a lighter note, January brings The Dude’s Guide to Manhood by Darrin Patrick. Among other forthcoming material is Know When to Hold ‘Em by John Blase (Abingdon Press, Oct. 1). Subtitled “The High Stakes Game of Fatherhood,” the author encourages fathers to become adventurers and risk-takers. In How God Makes Men (WaterBrook Press, Nov. 5), men’s ministry leader Patrick Morley reviews 10 key principles that emerge from epic stories of men. The Baker Books division of Baker Publishing Group releases two men’s titles in October. Gen. Rich Lynch teams with Mark Dagostino for Adapt or Die, a review of leadership principles taken from the battlefield and business, while human rights leader Bob Fu exhorts men to take a stand for their faith in God’s Double Agent. With many an eye trained on the military, No Place to Hide (Zondervan, February 2014), brain surgeon W. Lee Warren relates how he discovered meaning amid the carnage of war in Iraq. Though not in the military, anti-human-trafficking activist Danny Smith is nonetheless engaged in battle. He shares his own life-threatening experiences in Shouting Into the Silence: One Man’s Fight for the World’s Forgotten (Lion Books/Kregel, Sept. 1). Tullian Tchividjian, best-selling author and pastor, discusses freedom from failure, fear and guilt in One Way Love (David C Cook, Oct. 1), while Pastor David Jeremiah encourages men to deal with their fears in What Are You Afraid Of? (Tyndale, Oct. 13). Church planter Kevin Myers, along with best-seller leadership author John C. Maxwell, relates how a personal “train wreck” turned his life around in Home Run (FaithWords, February 2014). Additionally, three devotionals are among the new titles that will find male audiences. In 40 Days of Grace: Discovering God’s Liberating Love (Monarch Books/Kregel Publications, Sept. 1), ministry leader Rich Miller discusses sexual freedom. Kingdom Man Devotional (Tyndale House Publishers, Oct. 13) is based on Pastor Tony Evans’ 2012 preaching series, and Stand Firm: Let Nothing Move You (B&H Books, Oct. 15) aims to equip men as leaders in their homes, churches and communities. Because men’s titles often don’t sell in great numbers, Harvest House Senior Editor Steve Miller thinks retailers may overlook their possibilities. They need to take into account the Christian Living crossover effect, said Miller, who lists such examples as The Purpose Driven Life by Rick Warren and Experiencing God by Henry Blackaby. Danz sees year-round potential in men’s books, with small groups and reading groups always looking for new material. Given this search, the Zondervan executive encourages Christian retailers to ask male staffers or pastors what books have affected them most. Don Pape, vice president of trade publishing for David C Cook, said training store staff is also helpful. As an example, while America’s recent wars have produced popular books, wise retailers can use these to introduce customers to past men of faith like Adoniram Judson and Dietrich Bonhoeffer, he said. When describing the state of Christian fiction today in a single word, “flux” springs to mind. Dictionary.com defines it as “continuous change, passage or movement.” Christian fiction print sales have taken a beating at brick-and-mortar stores in the past few years, declining in dollars and shelf space in big-box retailers and Christian stores alike, while e-book sales have gained ground due to “flash” sale pricing and the increase in popularity of e-readers. That has turned the fiction category into a roller-coaster ride not only for retailers, but also for publishing houses. Guideposts announced in July the end of its fiction retail sales; Moody Publishers’ young fiction imprint, River North, said it will cut back on new titles this year; and B&H Publishing Group “reset” its fiction line in May, announcing it will only publish new fiction that ties in with ministries, external film partners and the like. It was only six years ago that B&H announced it would be investing heavily in fiction, hiring well-known editor Karen Ball and launching the website www.pureenjoyment.com the following year. On the up side, this fall Zondervan is launching new Young Adult (YA) imprint Blink, which will publish mainly fiction for teens (with select nonfiction and autobiographies); the FrontLine imprint of Charisma House Book Group hit the fiction big-time with runaway best-seller The Harbinger by Jonathan Cahn; and Howard Books announced it is beefing up its fiction offerings this year after signing a 10-book deal with Christian fiction’s reigning romance queen, Karen Kingsbury, whose hardcover novel The Chance debuted in the No. 1 spot on the New York Times best-seller list in March. Even with all the ups and downs, Christian publishers report feeling hopeful about fiction overall—hopeful that sales at Christian retail can rebound, that the effects of digital downloads are becoming more predictable and that Christian retailers should be able to poise their stores once again to be the go-to destination for Christian novels rather than big-box competitors. Christian Retailing spoke to representatives from the editorial, marketing and publicity teams of several Christian publishers, including HarperCollins Christian Publishing (parent company of Thomas Nelson and Zondervan), WaterBrook Multnomah Publishing Group, Howard Books and Bethany House (Baker Publishing Group) about the state of Christian fiction today, what trends they foresee and how Christian retailers can rebuild their sales in this category. Christian fiction sales quadrupled from $1 billion annually to $4 billion from 1980 to 2000, jump-started in the late-1990s by the best-selling “Left Behind” series by Tim LaHaye and Jerry Jenkins, according to a study presented at the 2009 International Christian Retail Show. When the post-rapture series took off, Wal-Mart, Barnes & Noble, Target and Sam’s Club hopped on the bandwagon and began aggressively stocking Christian fiction, and Christian retailers found themselves struggling to keep up with the discounted pricing. Then online powerhouses Amazon and Christian Book Distributors began to help themselves to large pieces of the Christian fiction sales pie; and in the last few years, e-readers and digital downloads carved out yet another big chunk of sales dollars. As orders shifted to online retailers and digital downloads, fiction sales at general market and Christian brick-and-mortar stores suffered. The 2013 BookStats report from the Association of American Publishers and the Book Industry Study Group shows that e-books have grown 45% since 2011 and now constitute 20% of the trade market. The largest e-book sales category? Adult fiction. Strangely, Christian market publishers feel that may actually bring a ray of hope to Christian retailers. Why? Because since readers are turning to their tablets for the latest titles, big-box stores are now pulling back, stocking fewer print titles for shorter amounts of time. CBA publishers say this gives Christian stores a renewed chance to pick up sales, if they are willing to give the category another look. The ongoing challenge for publishers is to connect with consumers in many places and spaces in order to help them find Christian fiction amidst the wealth of fiction, nonfiction, films, television shows, newspapers, magazines, games, websites that constitute consumers’ daily media menu. CBA publishers are trying to drive consumers to buy Christian fiction in any format they can manufacture, be it virtual or physical—so that they can keep publishing, period. Readers no longer discover books they like or uncover new authors they might want to follow at local bookstores. Instead, fiction audiences are developing their reading tastes online through “word of mouth” on Facebook, blogs, author websites and book-dedicated websites. Thousands of bloggers review Christian books, “blog tours” abound to get the word out about new authors and titles, and many a website is dedicated exclusively to Christian fiction. Zondervan created BookSneeze.com, a site where bloggers can request free books in exchange for reviews on their blogs and on retail sites like Amazon. For consumers, LifeWay hosts the Christian fiction blog “A Novel Bookshelf,” and WaterBrook Multnomah launched NovelCrossing.com last year, a site dedicated to becoming the “intersection of fiction and faith,” as its tag line reads. The site offers reviews of books from many publishers, author interviews, an interactive community and graphic resources to “pin” on places like Pinterest, Facebook and blogs. Christian fiction does seem to be succeeding in content. The quality of stories in the Christian market has increased significantly in the last decade, and publishers are branching out into many genres, as well as putting new spins on the tried-and-true. Hutton points to the upcoming contemporary debut novel Dear Mr. Knightley by Katherine Reay (Thomas Nelson, November) as a good example. “It is one of the more literary books that we would ever publish, yet it has strong commercial sensibility and lots of hooks,” she said. Publishers agree they are all continually looking for the next big thing—big idea, big audience, big voice. They look for new authors at writers’ conferences, through agent submissions and via blogs and self-published books in digital stores. As competition becomes stiffer, first- and second-time authors usually must have a built-in audience for a publisher to sign them or keep them on their list. “It may be harder to invest in those authors, but it is definitely something you have to do,” Buss agreed. One area that has always had room to grow in Christian fiction is Young Adult. In the general market, teens pick up fiction at Barnes & Noble, Wal-Mart or order it online. In the Christian market, teens generally don’t shop on their own at Christian retail. The teen books that sell in the Christian market tend to be nonfiction, books that parents pick up for their kids to read or youth pastors use in their youth groups. If teens do walk into Christian stores, publishers say they sometimes shy away from fiction because it is often shelved next to the kids’ section. In a move to capture a slice of the YA audience, Zondervan debuts new imprint Blink this fall, with six titles that will not contain overt Christian content, but instead will have “moral content” and be “hopeful” in tone. Blink books have been developed with the general market in mind to offer teens and parents alternatives to the graphic content found in popular teen fiction today, but Christian retailers also have been enthusiastic about the line. YA books need to be near music, T-shirts and jewelry—or at least away from the children’s section, publishers say, noting that teens don’t see themselves as kids and don’t want to be associated with the children’s department. Among the Blink debut novels for fall are Doon by Carey Corp and Lorie Langdon, a fantasy romance loosely based on the classic musical Brigadoon; Merlin’s Shadow, a book by Robert Treskillard that takes a new look at King Arthur’s court; Running Lean by Diana L. Sharples, the story of a teen couple dealing with real-life personal issues and tragedies; and a dystopian title, Remnants, by well-known CBA author Lisa T. Bergren. For Christian retailers, fiction is a category with room to grow—if they can entice customers to put down their digital devices and drive to the store. E-book sales may be here to stay, but that doesn’t mean all brick-and-mortar Christian stores are doomed. With each arrival of a new media format, there have been predictions that older formats would die. In some cases, that prediction has come true. Cassette tapes did replace 8-tracks. CDs replaced cassettes. DVDs replaced VHS tapes. However, television did not signal the end of movie theaters. Redbox and Netflix have not shuttered all theaters either. Instead, time has shown that consumers like to watch movies across many channels. Likewise, the newest digital devices and delivery systems have just squeezed into the existing media mix, perhaps taking more sales than their fair share, but not necessarily taking over. Yes, consumers read news online, but many also still like to hold a newspaper or magazine. E-readers are handy for carrying an entire library around all at once, but not many want to take them to the beach or the pool, not to mention that it’s hard to wrap an e-book and take it to a friend’s birthday party. The problem for physical retailers is that online content needs to point customers to their stores, not just fuel online sales. It’s easy for consumers to read a review, decide they want the title and click through to buy it and begin reading immediately. But for Christian fiction consumers, the ease and unlimited virtual shelf space can be both a blessing and a curse. There is more to choose from than ever before, but that certainly doesn’t mean all the books are good or that they can all be trusted to provide clean, hopeful or gospel-based content. Christian retailers can win back customers by offering online marketing and old-school customer service they can trust, by finding readers online through Facebook and Pinterest, and by offering digital coupons, flash sales, exclusive events and other in-store-only opportunities. Retailers can keep customers engaged by Tweeting; investigating ways to participate through sites like Shopkick, Foursquare and Groupon; and by surveying their customers about their online communities and spaces. Publishers say they’ll help by connecting stores with their customers’ favorite authors through book signings, online chats, links to author websites and custom editions, with several publishers making exclusive editions available to retailers. Once customers have an online incentive to walk in the door, stores can make sure they get exactly what they need. Possibly more than any other book category, fiction is a section frontliners need to know. Fiction readers love to talk to other fiction readers. They want recommendations from others who clearly demonstrate a knowledge and passion for it. Good, old-fashioned hand-selling is still a key ingredient to fiction sales. While daily Bible reading may be trending down, interest in small group book and Bible studies remains intense—a fact that one editor believes signals that this market is alive and well. Recent research, including a survey released last fall by LifeWay Research, has identified a long-term decline in Bible reading. Only 19% of Protestant churchgoers reported reading their Bible daily. However, NavPress Senior Editor Jeremy Maxfield pointed out that weekly (59%) and monthly (82%) Bible readership is still high. “Even if an actual decrease in market does exist, what other business would not try to serve and grow a potential market share of 40% of the nation’s adults engaged in a niche interest at least once a week?” asked Maxfield, editorial director of the company’s church resources division. Nancy Guthrie, author of the Crossway series “Seeing Jesus in the Old Testament,” attributes this fervent participation to the accountability that helps participants stay on track with their Bible reading. “We also need the wisdom of those who have studied more than we have and the insights of others to help us to understand and apply what we read to our lives,” said Guthrie, whose fifth title in the series releases next May. The benefits of this interaction are fueling interest in small groups as well as congregation-wide emphases, said an executive with Abingdon Press. As church growth through small groups has accelerated—particularly via multi-site megachurches—P&R Publishing has targeted more titles to meet those needs, said Ian Thompson, vice president of sales and marketing. “If it is possible for a book to be used by a small group, we make it so,” said Thompson, whose company annually publishes 40 new releases, about a third designed for small groups. Publishers see other trends in small-group studies, most notably DVDs accompanying printed materials. That is the case with such titles as a forthcoming participant guide and DVD for Joanna Weaver’s classic, Having a Mary Heart in a Martha World (WaterBrook Press, Nov. 19); Hamilton’s Love to Stay (Abingdon, August); gospel singer Babbie Mason’s This I Know For Sure (Abingdon, Sept. 1); and the DVD linked to Liz Curtis Higgs’ new edition of Bad Girls of the Bible (WaterBrook, July). Salley said participation improves with easily accessed material, prompting the Nashville publisher—and many others—to mesh print and video via apps and facilitate online communities. Still, books can extend the teaching period beyond group time, said P&R’s Thompson, whose company often produces printed studies in partnership with video producers. In addition, over-reliance on DVDs can dull group interchange, cautioned Amy Nappa, executive editor for adult and church leadership at Group Publishing. Not surprisingly, the three latest titles in Group’s “E-412” series this summer are solely comprised of 80-page, six-lesson paperbacks: Better Together, Leading Out and This Means Love. Women represent the leading audience for small-group materials, said Jim Stropnik, marketing manager with Concordia Publishing. Among the titles releasing this month appealing to women are a pair by author Margaret Feinberg for the “Women of Faith Study Guide Series,” God’s Living Word and In His Eyes (Thomas Nelson). Harvest House Publishers releases two this month from Stonecroft Ministries, Discovering the Joy of Jesus: A Guide to Philippians and Growing in the Christian Life: A Guide to James, while David C Cook offers The 30 Day Praise Challenge, with Becky Harling challenging women to praise God 20 minutes a day for a month. Questions are online for Harling’s study. Other studies for women include Becoming Myself (David C Cook, Aug. 1) by best-selling author Stasi Eldredge and The Women of Christmas by Higgs (WaterBrook Press, Sept. 17), which originated with the author’s Bible study blog. Studies for men and women include a pair from InterVarsity Press that look at putting God first in one’s life: A Guide to the Blessing Life by Gerrit Dawson (IVP Books, September), a companion to The Blessing Life trade book, and Free by Mark Scandrette (Likewise, August), which includes a group study guide in the book. InterVarsity is also creating eight downloadable Free videos that are accessible by code to those who purchase the book. Pastor Greg Laurie follows up spring’s Essentials (NavPress) study with Following Jesus in September, and Brett McCracken looks at interacting with popular culture in Gray Matters (Baker Books/Baker Publishing Group, August). Industry figures see a number of ways to promote these studies, with Maxfield suggesting retailers publicize group discounts. He said the goal is building a trusting relationship, not just a sale. “When people see (the NavPress) brand, our desire is they know what they are getting, regardless of the author or topic,” Maxfield said. Before promoting, Abingdon’s Salley said a retailer must understand the particular church’s goals, such as starting home groups, reaching young mothers or reinvigorating Sunday school. With some programs including a dozen components, Salley said retailers can help leaders see the possibilities. Nappa thinks retailers should host small-group meetings. As retailers gear up for the critical holiday season, Christian publishers are making books available that foster nostalgia and illuminate the real hope that the birth of Christ brings. Many of the holiday fiction titles are either historical, Amish or both, providing the sense of returning to simpler times. From Zondervan comes Tricia Goyer’s first Christmas novella, A Christmas Gift for Rose, which features a young Amish woman born in the midst of the Great Depression. Daisy Hutton, vice president and publisher of fiction at HarperCollins Christian Publishing, says readers enjoy stories about how Christmas was experienced in the past. In nonfiction, Ann Voskamp, best-selling author of One Thousand Gifts, takes readers back to the Old Testament to explore Jesus’ lineage in The Greatest Gift from Tyndale House Publishers. Using the Advent tradition of the Jesse Tree, Voskamp’s holiday book retraces the history of mankind paired with daily readings pointing to why Christ was born and why we celebrate His birth. Also reminding readers of the first Christmas story and the peace it offers the world is a gift book by Katherine Paterson, acclaimed author of Bridge to Terabithia and other novels, who twice won the National Book Award and twice the Newbury Medal. Published by Westminster John Knox Press, A Stubborn Sweetness and Other Stories for the Christmas Season is a collection of short stories Paterson originally wrote to be read during her church’s Christmas Eve service. For daily reflection and application, Houdek pairs the Scripture readings for Advent with the words and deeds of St. Francis of Assisi to help readers grow in their faith and spiritual practice. With entries for each day of Advent and through the Christmas season, this book of reflections guides readers through the treasures of the Gospels and takes a fresh look at the Christmas story. This large hardcover book opens to display a full-color, 3-D nativity scene with opening flaps, pop-ups and press-out figures to add to the scene. A 16-page book telling the story of Jesus’ birth is also included. In this 32-page picture book, Lucado tells the story of two mice, Itsy and Bitsy, who hear that a King is coming to Bethlehem and set off to find him. Although they are told along the way that they are too little and unimportant for a king, they learn that Christ has come for everyone—big or small, young or old. With a die-cut carry-along handle, this Advent activity book includes crafts, puzzles and stickers to keep kids busy. Along with her engaging illustrations, Engelbreit celebrates the season with classic carols, poems and the story of Jesus’s birth. Meyer tells youngsters about the miracle of Christmas in this fourth installment of the “Everyday Zoo” series. Hayley Hippo and her quirky animal friends set out to put on an annual pageant, but learn that Christmas isn’t about glitz, but about Christ. Each paperback in this quartet of cookbooks contains recipes and holiday inspiration for bread lovers, chocolate lovers, cookie lovers and candy lovers, respectively. They include: Have Yourself a Toasty Little Christmas (9781624161346), I’m Dreaming of a Chocolate Christmas (9781624161339), O Christmas Cookie (9781624161353) and Walkin’ in a Winter Candy-Land (9781624161360). Inspired by a true story, Goyer’s first Christmas novella tells the story of Rose, born during the Great Depression and raised in an Amish family. When Rose learns she was born Englisch and was abandoned, she is filled with questions. Set in the 1840s, the nine romances in this book are written by Christian fiction authors, including Lauraine Snelling, Kathleen Fuller and Vickie McDonough. Rachel Milligan is caring for her 7-year-old niece, Holly, when Holly’s parents suddenly die. When an Amish relative is awarded guardianship, Rachel takes Holly to the Amish community to seek custody, but also encounters family secrets and experiences the healing of old wounds. When young Rebecca Shrock’s brother, Levi, returns from combat tours in Iraq and Afghanistan, things get complicated. Levi has been rejected by his old flame and shunned by the Amish community of Paradise for joining the military. As God works in hearts, will there be faith and reconciliation at holiday time? When Annie’s family takes her to New York City to experience English life and decide whether or not she will be baptized in the Amish faith, a young Amish man who has long been attracted to her grows concerned that she won’t return to their quieter life. Will Annie go home, or stay and pursue her dreams? This title is part of Cameron’s “Quilts of Lancaster County” series. Fans of Gabhart’s Shaker stories will recognize Harmony Hill, where this tale is set in 1864. When Heather Worth discovers she is expecting while working as a laundress in her husband’s army unit, he insists she go home, where her father refuses to forgive her for marrying a Yankee. She retreats to a Shaker village where she and her aunt are in need of love and forgiveness as Christmas approaches. Featuring Annie, from Chapman’s best-seller A Simple Amish Christmas, this contemporary romance follows Annie’s preparation of a crib quilt for her sister-in-law, who is expecting. When the baby arrives early, Annie discovers the quilt may hold more significance than she imagined. This book is part of the “Quilts of Love” series. Sadie is pressured by her Old Order Amish family to settle down after four years of mission trips to Peru. She joins forces with Levi, a confirmed bachelor, to keep their families from meddling, only to discover that the walls they have built around their hearts are crumbling. It’s Christmas 1945 when widow and single mother Bev Winters discovers unexpected kindness and romantic love. Also included are 1940s’ recipes, handcrafts, stories and trivia. This compilation of stories is about realistic characters who have forgotten the true meaning of Christmas due to loss, pain or life circumstances. In unexpected ways, each realizes that even in darkness the joy of Christmas shines bright. Six well-known communicators explore various aspects of the Christmas story in this gift book. In this full-color devotional gift book, readers learn the stories behind 40 Christmas carols. This 26-day study is based on Advent-related words with each reading organized around a word that begins with a successive letter in the alphabet. Also included are discussion-starters, games, crafts, meditations and outreach projects. Graham celebrates Christ’s birth in this devotional booklet with excerpts from the best-selling This Christmas Night, hymns, scripture and poetry by his wife, Ruth Bell Graham. This drama presents the biblical story of Jesus’ birth, rather than what some traditional portrayals offer. A music CD including five original folk songs is also available. Using the Advent tradition of the Jesse Tree, Voskamp traces the history of mankind from Adam to Christ to help readers celebrate God’s greatest gift. This Bible study explores the stories of the women who played key roles related to the birth of the Savior: Elizabeth, Mary and Anna. Christmas Stories for Bedtime includes 30 stories drawn from Scripture, challenging children to consider the meaning of the first Christmas. People around the world began posting their thoughts in journal format on the World Wide Web starting in the late 1990s. Short for “weblog,” the “blog” format grew in popularity, and today Wikipedia claims there are close to 200 million blogs in existence.